Learn how LEGO® camps and classes can help unlock your kids’ interest in S.T.E.M. subjects and build important life skills. Plus: Discover 4 questions will help you find the right LEGO® program for your child. Fun fact for LEGO® fans: These versatile building bricks got their brand name from a mashup of two Danish words: leg and godt, meaning play well. Since LEGO® bricks were launched in 1958, kids and adults alike have certainly taken “play well” as a personal challenge, creating LEGO® masterpieces (Will Ferrell’s New York scene in the movie Elf comes to mind), attending LEGO® festivals and conventions, and flocking to see The LEGO® Movie last year. If you’ve got a kid who loves all things LEGO®, here’s a great gift idea that can help them take their building skills far beyond play time: Enroll them in an after school class or camp that uses LEGO® bricks as a tool for exploring, learning, and having fun. Kim Nguyen-Ehrenreich is owner and executive director of Bricks 4 Kidz San Francisco, an organization that does just that. Her company (which has franchises in in all 50 states, as well as Puerto Rico and the Virgin Islands), teaches the fundamentals of S.T.E.M (science, technology, engineering, and math) subjects through the use of LEGO® bricks, using custom model plans created for Bricks 4 Kidz by engineers and architects. The Bricks 4 Kidz programs don’t serve as another hour of classwork for kids, says Kim, but offer kids an engaging way to learn science and tech through hands-on building. Specifically, these “S.T.E.M. enrichment” courses guide kids to learn math, science, engineering, and technology concepts to help them build LEGO® models and robots. “Anything that’s interactive makes learning a lot easier,” says Kim. “I think our main goal is to get the kids to be excited about S.T.E.M. subjects so they can move forward in that area.” By learning how these subjects apply to something they love – LEGO® bricks – kids may develop an interest in S.T.E.M., eventually leading to success in school and a rewarding career. Why Not Just Build at Home? Is class placement based on both age and skill level? In LEGO®-based programs, the curriculum should be age-appropriate, says Kim, but instructors should be sensitive to the needs and abilities of each individual child. 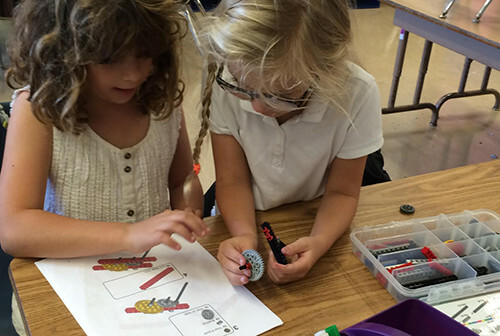 “Some kids have really defined fine motor skills as a kindergartener,” she says. This means they might be really good at manipulating tiny bricks and assembling more complex models than other kids in their grade. At Bricks 4 Kidz, children are paired with others who have a similar skill level, which helps them work together in a way that allows them to build their self-confidence and learn cooperation and patience. Is the curriculum unique to that program? Kim’s program uses special plans created by engineers and architects. This means that the kids in her programs will be completing models that aren’t available elsewhere. What are the goals of the program? For the younger kids, goals are probably more basic. Children might learn to break down a project into small goals and solve problems along the way. They begin by sorting and identify the pieces, reading simple project plans, and learning how different bricks and gears work together. As kids get older, they can explore other skills, such as using pre-coding software to direct a robotic LEGO® creation to move or make sounds upon command. Is there individualized attention? Rather than have a lot of kids working on one big model, Bricks 4 Kidz encourages children to work in pairs and on smaller, motorized models. She says this gives each child plenty of hands-on time – and a greater sense of accomplishment. For girls, are there gender-neutral or girls-only programs available? Currently, all Bricks 4 Kidz programs are gender-neutral, says Kim, but she plans to expand the girls-only offerings in the coming years. “Particularly with middle-school girls, it’s hard to keep them interested in S.T.E.M. subjects,” says Kim. “We have to pull them in a little more and help them build their confidence.” Programs designed for girls can help do just that. What are the instructors like? When hiring instructors, Kim looks for people who are going to be mentors for kids. “We look for people who love to be with kids and to be able to help them learn,” she says. “They make a connection with the kids and encourage them to take on challenges. We have kids coming out of our programs really loving our teachers.” Ask to meet with some of the instructors, ask for some specific information about the teachers, or read their bios so you can tell if the teacher will be a good match for your children. One of the easiest ways to encourage your kids to get more out of every LEGO® session at home, says Kim, is to sit down and play with them! “I think when parents sit down with their child, that helps kids feel confidence in building,” says Kim. “And it helps build the level of connection between the parents and their kid.” Though Kim acknowledges that it can be tough to find time to build with your children on a weekly basis, her company sometimes offers mother-daughter and other parent-child workshops that carve out a bit of time for you to bond over a big, colorful pile of these time-honored toys. Ready to see what LEGO® classes and camps are offered in your community? ActivityHero can help! Check out our special LEGO®-based offerings today, and give your child a LEGO®-related gift that will keep them playing happily throughout the winter!